-14 R McGowan (Eng); -11 C Felipe Aguilar (Chi), A Wall (Eng), H Porteous (SA), J Hugo (SA); -10 S Manley (Wal), J Carlsson (Swe). Selected others: -6 A Johnston (Eng), R Davies (Wal), M Foster (Eng); -5 L Canter (Eng), P Lawrie (Sco); -4 D Howell (Eng); -3 E Els (SA). 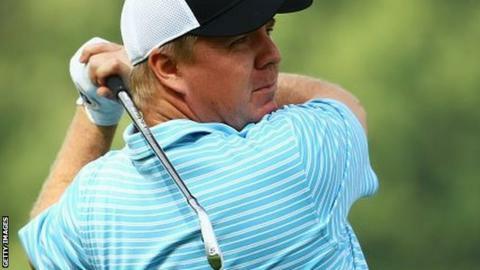 England's Ross McGowan shot a second-round nine-under 62 to take the halfway lead in South Africa's Joburg Open. McGowan, 33, fired two eagles, six birdies and a bogey to finish 14 under, three shots ahead of countryman Anthony Wall, Felipe Aguilar of Chile, and home players Haydn Porteous and Jean Hugo. McGowan won the Madrid Masters in 2009 but lost his European Tour card in 2011 before regaining it last November. Four-time major winner Ernie Els made the halfway cut on three under. Wales' Stuart Manley is four shots adrift of McGowan after a second successive five-under par round. Essex-born McGowan reached the turn in 33, and birdied the 10th before holing his second shot to the par-four 12th for an eagle. He picked up another birdie on the 14th then holed from 15 feet for an eagle on the par-five 15th to complete the back nine in 29. "I played well yesterday and started well today," he said. "It went a bit flat for a few holes, then on the back nine the fireworks started." Three players who finish in the top 10 at the European Tour event can secure places in this year's Open Championship at Royal Troon from 14-17 July.